The live music scene been stirring the embers of soul music lately, poking it around a little and blowing the cinders enough to bring back the glow of an almost forgotten musical genre. Royal Southern Brotherhood are dong the same but put their own spin on things. For while the likes of Derrick Trucks, JJ Mofro and Curtis Salgado have all reached back to inject fresh life into soul music, RSB have thrown their hats into the ring with a tasty, soulful and rocking dish worthy of their collective heritage and New Orleans recording base. Their self title debut album is a perfect mix of rock and soul with a bluesy heart and a southern rock feel, all shaped by great playing and several deep grooves that reflect the organic feel of a band playing as one entity in the studio. 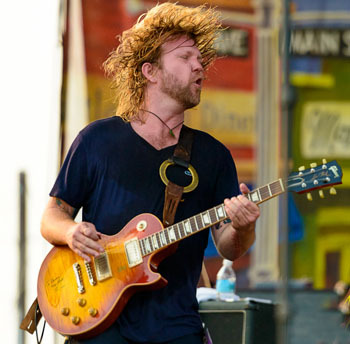 Royal Southern Brotherhood is built on the formidable Neville and Allman Brothers heritage. 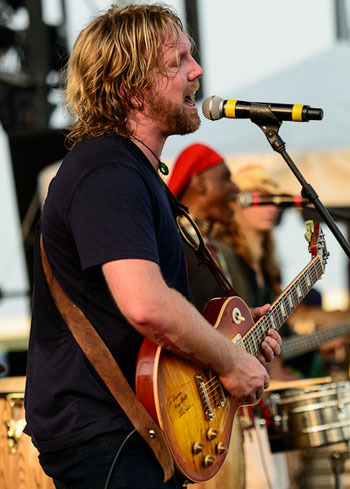 The band feature vocalist/percussionist Cyril Neville and vocalist/guitarist Devon Allman, as well as sometime honorary Allman drummer Yonrico Scott (also of the Derek Trucks band). 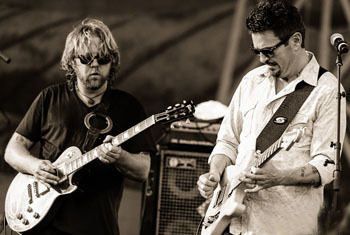 But there's another interwoven link and it is the 2009 Blues Award winning song 'Pearl River' that featured the combination of Cyril with Mike Zito. The band is completed by southern jam session bass player Charlie Wooton, as part of a stellar line-up that has nearly as much to lose as they have to gain. 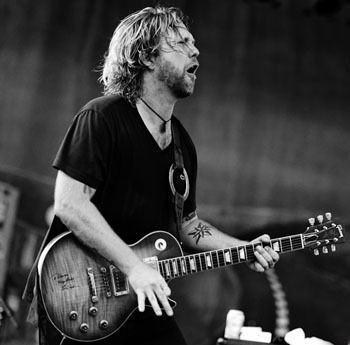 Pete Feenstra asks guitarist Devon Allman about the new band. Are you surprised about the enthusiasm with which both the album and band has been received? Yes actually as I really though it would take a lot longer that it has. We all hoped people would connect with the band and the idea, but there's been a real buzz about the thing from the start. In fact the word got spread around very quickly which I think is a very good thing as it means people have connected with the music in the way we hoped they would. Well there was obviously Cyril's background but there's plenty of rock too. I mean my own background as a kid in high school was steeped in stuff like Kiss, The Rolling Stones and Cheap Trick etc, but then I kind of looked around a little and discovered people like James Brown and more obviously BB King and it seemed like the direction in which to go. And we really didn't come to this album with many pre-set ideas, I mean we didn't suddenly start and say let's do this, it was more the case that we'd be working loosely on a song - jamming it around a little - and we'd hang on to a common thread. There are still elements of rock and roll and blues but once you start working in and around a place like New Orleans and its surroundings things take their own shape. The band cut the album at the Dockside Studios, in Maurice Louisiana, south of Lafayette and roughly two and half hours due west of new Orleans and then prior to the tour they headed for rehearsals for the tour at Don Odell's Legends Studio in Palmer, Massachusetts. It was there that they also taped a promo clip for the "Legends" TV program that is distributed through public-access cable stations. So the studio was a major factor in the feel of the album? 'Tons of people had recorded at that studio, BB King, Dr John, Derek Trucks etc, so the vibe was good and the chemistry of the new band kind of followed and everything fell into place. But the real determining factor for me was the fact that when you work with artists like Cyril and this killer rhythm section, you pretty soon start to become influenced by the players and the surrounding, you know the stuff you hear in the clubs etc and it's a case of soaking it all up. Mike and I used to work in a guitar store together in St. Louis about 13 years ago, right about when he was starting his career and I was just setting out with Honeytribe. We were both of us starting out as young men, so we kept tabs on each other careers. In the end we ended up with the same manager, Rueben Williams. So at this point I was looking for a new guy to manage me with maybe a change of direction and it seemed to make sense that if he was dong a good job for Mike, it could also work for me. Rueben then came up with the idea that we should try and get together and maybe write a few things. That was something like 14 months ago. It seemed ridiculous at the time, especially as I'd never met Cyril before and I hadn't actually seen Mike for something like 2 years, but we gave it a go and so far it's going very well. The whole thing was very spontaneous and organic. We'd write something and if it worked we would go on to something else, and it just carried on from there. How did you decide on the material? The whole thing was very spontaneous and organic. We'd write something and if it worked we would go on to something else, and it just carried on from there. Everyone pitched in at some point. Did you have completed songs when you got to the studio, or did you shape them up at the point of recording them? I'd say 70% of it was ready and the other 30% was massaged when we got to the studio. I mean we had a good idea of what tunes we thought would make it on to the record at that point, though the producer Jim Gaines helped in the shaping of the whole thing, He was very unobtrusive, but occasionally made good suggestions; he's really good like that. Was the actual recording process done as a band? Yes it was. We arrived on a Sunday and Monday and started working and 5 days later it was all but done with very few overdubs. In fact songs like 'Brotherhood' are 100% live and I think I might have done just the one vocal on 'Left My Heart In Memphis' and then we went in and cut it. Once we got to jamming around on some of the stuff it took its shape. It was a big change for me as I usually like to work on different things, but this was all done incredibly quickly. I think Mike got it right when he said we recorded the performances rather than the songs. On that song 'Nowhere to Hide' I used a 1953 Airline resonator which I bought in New York. It's got lots of vibe and has the feel of a certain era, and it gave the song a soulful, slinky, swampy feel, in fact the song almost wrote itself, it's a great example of the gumbo of this project. Were the songs cut in order of the album or shuffled round to find a flow? Well as a matter of fact I think 'New Horizons' was the first track we did and probably 'Brotherhood' was the last, but we recorded the rest and then looked at it all and pretty soon we had the whole thing. It worked because I think Cyril had his soul vibe going and I brought in what I do with Honeytribe and Mike added his Rollin Stones vibe and it just worked. Like I said man, we didn't set out to do anything in any particular order; it was far more organic than that. We'd do something and then look at it and we'd say why you don't do something there and then pretty soon it all took off. The track order and everything happened when it came to mixing and mastering stage. How much of the material are you playing live? Whose idea was 'Fire on the Mountain? Well Cyril had already been playing it live and I already knew the song as well and then it ended up on the set list in the first few shows to fill out the space. It went down really well and so we've kept on playing it and then we recorded it. When we started on the material we just clicked. I couldn't believe how fast we locked into something that worked so well. Given the three part vocal harmonies, did you have to make any major adjustments to the way you sing on the album? Not really, but it was just the greatest thing for me. I mean I've spent most of my time singing lead vocals as the front man for Honeytribe and the only other time I've sung like that would be when I was harmonising with the an album in my car. 'Gotta Keep Rocking' was the first song you wrote with Cyril, did it feel different working with another song writer? Actually it might even have been the first song that we wrote for the record, aside from 'Horizons'. And it proved to me that if we could do this, we could do the whole thing and we never looked back. It is different but it was enjoyable and the songs seemed to come naturally. You've also go some elaborate video footage for the album, how did you hook up with Yadira Rodriguez? Haha, yeah, I know her from New York where she had worked on a big TV thing called 'Man v Food' that checks out cool mama and papa eateries. So she came in on the project and she killed it, I mean really captured what we are about. Do you regard RSB as a supergroup? No not at all, but its something that the press have hooked up on, I suppose given the musical history of the people in the band, it's an obvious thing, but it's not something that we aspire to. Did you end up with the album that you set out to make? Yes and more. We thought it would be cool if the songs we did could resonate with people, but they have developed beyond that. And the band has also already gone beyond our initial expectations. Does the live show include anything from your respective backgrounds? Yeah, we play the whole album but we also pull out stuff from all our own careers because I guess it's something that people expect given our respective backgrounds, and people really seem to like us doing that. Finally, there's a popular YouTube clip of you and Mike doing several classic rock intros on your guitars at one show. Where did that idea come from? Yeah, that was funny. It all started when I was in Honeytribe and one night I did the intro to 'One Way Out' which is a song we play and then I suddenly stopped and teased the crowd a little. I couldn't help but noticed the audience reaction as they went crazy. So the next time I tried vary it a little and played the intro to Tom Sawyer' and so on and so forth. So then I thought it could be fun to do it with this band especially as we had two guitars. Mike and I had previously messed around in the guitar centre. We used to laugh at some of the stuff we'd hear like the insane Metallica shredders etc, and here we are now, years down the road fooling around in the same way, but I think everyone likes it. RSB play UK dates in November 2012.